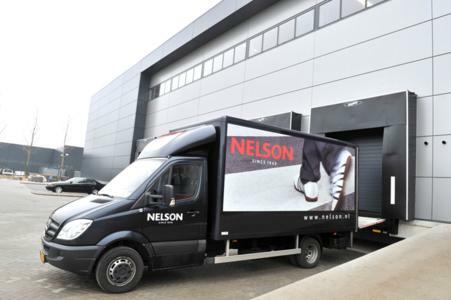 Dutch shoe retailer Nelson Schoenen's continual rate of expansion had put immense pressure on the company's warehouse operations, not least in terms of storage space. With the owners keen to continue along their path to growth in the years ahead by opening numerous new stores and expanding the company's webshop, the time was ripe for relocation to new premises - and this presented the ideal opportunity for considerable efficiency gains through automation too. The recent implementation of Denso wireless barcode scanners has enabled the company to shave a whole day off its standard delivery times to its retail stores, thus reducing out of stocks and improving its service to consumers. Meanwhile, integrating the terminals with Nelson's ERP system through a new WiFi network has dramatically improved the speed and cost efficiency of the company's logistics processes. Seen from the road, the new Nelson Schoenen building appears very much 'under construction', although it's not hard to imagine how the glass-fronted headquarters will look once work is completed in mid-April 2012. At the rear of the building, however, the newly laid car park with its five loading bays provides a hint of what is inside: a spacious and ultra-modern distribution centre, where thousands of pairs of shoes are received, sorted, stored and dispatched every day. Since Mr Neelissen opened his first shoe shop in the town of Purmerend in 1949, Nelson Schoenen has grown into a well-known shoe retailer in The Netherlands. Now run by the third generation of the family, the company operates a chain of approximately 100 stores selling a wide range of A-branded shoes under the Nelson, Hobb's Fashion Shoes, Ecco and Geox names, primarily in the western part of the country. Nelson Schoenen also recently launched a webshop (www.nelson.nl) to reinforce its brand image and capitalise on the shift in consumer purchasing behaviour. 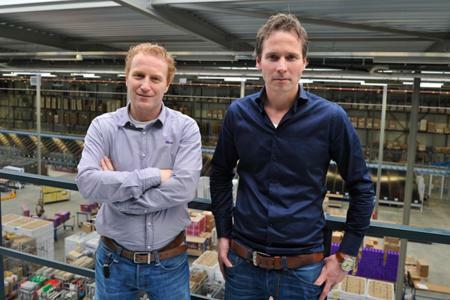 The company's steady rate of expansion had increased pressure on logistics operations at its premises in Hoofddorp, a stone's throw from Amsterdam's Schiphol Airport. At only 2,500 square metres, the warehouse had become too small to cope with current volumes. Temporary storage had been rented nearby to hold seasonal stock, the lease on which was due to expire at the end of 2011. In mid-2009, with both this and the projected growth in mind - the company has ambitions of opening up to 50 new stores in the longer term as well as expanding its online sales - management decided to build new headquarters. The new premises were to house both the offices and the warehouse operations, with a 7,000-square-metre distribution centre almost trebling capacity. Construction work began in January 2011 and building work was completed - on the warehouse section at least - in December 2011. After a smooth transition, the logistics operations have been up and running at the new address since the first week of January 2012. Ivo Flierman joined Nelson Schoenen as IT Manager and ERP Analyst in December 2010 from ERP software supplier PFA Group BV, and his experience proved useful when designing the set-up for the new premises. "By introducing Denso handheld terminals in early 2011, Nelson had already achieved time-savings of 20% to 30% on its order-picking activities for store deliveries," says Ivo. "This move presented the ideal opportunity to save a lot more time and further improve our cost efficiency through automation and systems integration." A project group comprising Nelson's Logistics Manager Hans van Es, Director of Operations Hein op den Velde, Ivo himself plus several others brought together logistics expertise, applications expertise and knowledge of the individual processes in one team. Conscious of the unyielding deadline of 31 December 2011, group members met every week to keep the project moving forward by reviewing progress and, even more importantly, making decisions about the next steps. 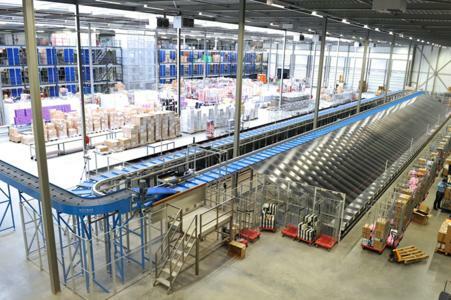 Nelson intended to automate its warehouse operations by installing a WiFi network through which its handheld barcode scanners and new automatic sorter could communicate with the central ERP system. The company required new WiFi-compatible RF terminals that were robust enough to cope with intensive handling in a warehouse environment, had a large display for good legibility, and had an open platform to allow seamless interfacing with the company's ERP software. Zoetermeer-based C.N. Rood was among the handful of auto ID equipment suppliers invited to submit proposals. C.N. 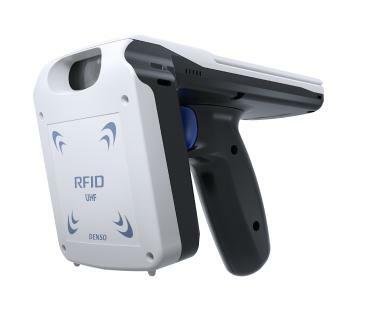 Rood's proposal included Denso BHT-700 handheld scanners as well as installation of the entire WiFi network, including all the necessary access points plus an on-site survey beforehand and post-installation testing. Recognised as offering WiFi competence, proven problem-solving abilities and high standards of customer service, Paul van der Kraan from C.N. Rood was given the green light in November 2011. "We were already working with Denso scanners and were more than happy with their performance, plus the proposed BHT-700 met all of our requirements," recalls Ivo. "This new project was particularly risky, since everything depended on the WiFi network. I'd been particularly impressed by how C.N. Rood had dealt with a specific problem we'd had in the past. Hence, for this project, I had absolute faith in C.N. Rood's ability to deliver reliably within the tight deadline." Nelson confirmed the order and C.N. Rood set about arranging Denso BHT-700 barcode scanners and a fully functioning WiFi network in time for the move. Nelson's new warehouse features a number of innovations, and one of them in particular - the 'experimental' racking-supported mezzanine shelving system from the company SSI Schaefer - presented C.N. Rood with an extra challenge. With the racking units extending vertically with platforms built onto them horizontally to create several floors, this construction is built entirely of steel, which is known to have a negative impact on the WiFi signal. Paul: "When we conducted the site survey in mid-November 2011, the warehouse was still empty so I had to take that into account in the assessment. Once a warehouse is full, the products themselves can affect performance - in this case, the moisture in shoe leather could absorb the RF, partially blocking the signal - so I erred on the side of caution. After all, this was one deadline no-one could afford to miss. They feature CleanAir technology, meaning they search for free channels automatically in the case of interference, thus ensuring continual network coverage." A key reason for Paul recommending the Denso BHT-700 terminals was their 5GHz capability, which further guarantees network reliability by eliminating potential interference from outside sources. The deadline was met, and, as Ivo himself puts it, "This implementation went better than we'd ever dared to hope for." The warehouse handles three core processes: cross-docking, replenishing stock held by the individual stores, and transferring stock between individual branches. Products are placed on Nelson's new, automatic sorting system (15 metres wide with a 70-metre-long conveyor) to be scanned and sorted into one of 130 chutes, one for each individual retail store and several for stock and overflow. There is room at both ends of the system for extra chutes to be added as the company continues to expand. Running at maximum capacity, the system can handle 5,500 pairs of shoes per hour. Products are loaded onto a trolley at the end of each chute. The shop-specific trolleys are wheeled to one side to await collection by the company's own fleet of delivery trucks. At the stock chutes, an operator scans barcodes using a Denso terminal which indicates the relevant quantity and shelf location for each item on its large display. One of the key benefits of the BHT-700 RF scanner in conjunction with Nelson's ERP software is the routing functionality; this calculates the optimal route for the operator to take through the warehouse when storing or picking items. "The routing functionality has reduced the amount of time operators spend walking backwards and forwards, which means considerable savings in view of our 3 floors and 33 aisles per floor," explains Ivo. "Plus, now that the BHT-700 scanners do a lot of the 'thinking', it means that staff need less training on the warehouse layout - which is a definite advantage when working with temporary staff in busy periods, for example." 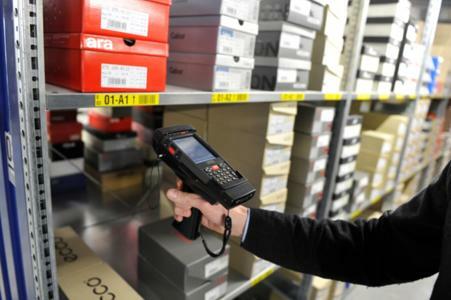 Scanning the barcode on the shelf to add or remove goods automatically adjusts the stock level in the ERP system, thus reducing the likelihood of errors and saving operators having to waste time troubleshooting. "Our operators have also commented on how lightweight the BHT-700 is, even in intensive use. The gun grip improves their scanning speed, and the clear display ensures that it is easy to read," Ivo explains. "Another plus point is the long battery life. At peak times, the terminals can be in use for 8 hours non-stop. The batteries need to be able to withstand that - and they do!" The time saved in this efficiency drive is generating several concrete benefits, as Ivo explains. "If a product is sold in a store before 4 p.m., we will soon be able to deliver new stock the next working day, for example, which is an improvement of a whole day on the old system. Also, by completing the regular logistics processes more quickly, we can free up time for other tasks. We've introduced stock-taking as part of the weekly routine, for instance, which means we no longer have to interrupt our logistics operations for an inventory check twice per year. We're also using the extra time to plan ahead and communicate better with our suppliers on upcoming deliveries - we're moving from a reactive to a proactive approach." While seasonal peaks and troughs will never be eliminated completely, this systems-integrated approach has definitely helped Nelson to remove some of the stress from the situation. While the company has already made impressive gains, Nelson plans to improve efficiency even further by automating other processes. The next step is to switch from store-based picking, which takes an operator approximately 45 minutes per store, to batch picking for up to 50 stores at once and letting the automatic sorter do the rest - the potential savings are immense. There are also plans to automate the handling of online orders. The automatic sorter will first separate single-item orders, which can be despatched to consumers immediately, from multi-item orders. Then, since goods to fulfil the multi-item orders may come from stock held in different individual stores, each order will be assigned to an individual location in the warehouse. The items will then be stored there until the order is complete, thus avoiding double delivery charges. The goods are then picked as normal using the scanner and prepared for shipment. With storage capacity for 550,000 pairs of shoes, there is now room to allocate an individual shelf location for each SKU, making it much easier and quicker to pick items. As Ivo puts it, "It might be a less efficient use of space, but it's certainly a more efficient use of time. We're now ready to cope with future growth from both our bricks and clicks retail activities." Toyota Tsusho ID Systems GmbH belongs to Toyota Tsusho Corporation Worldwide and is responsible for the sales and distribution of DENSO handheld terminals and scanners in Europe. Founded in 1948, Toyota Tsusho Corporation Worldwide has a total workforce of 32,380 and in 2010 achieved annual sales of 54,8 billion US dollars. The market segments covered by Toyota Tsusho ID Systems GmbH extend all the way along the supply chain from manufacture, production and logistics through to retail.